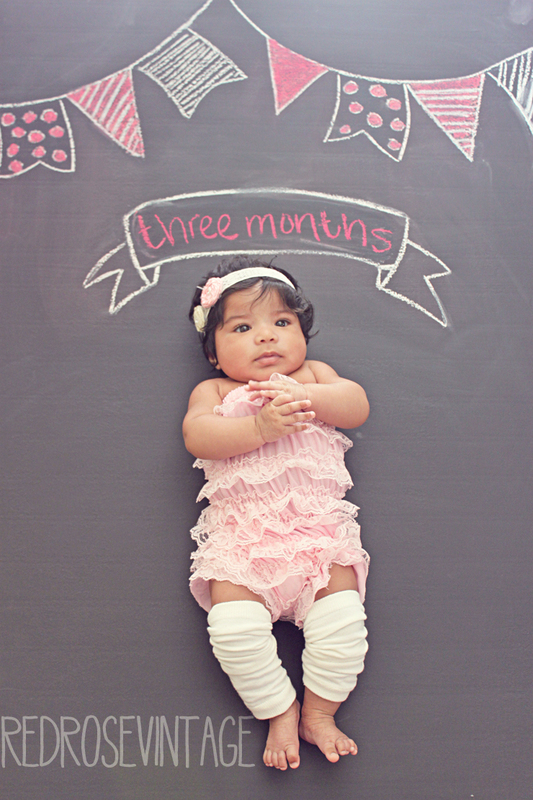 HAPPY 3 MONTHS MY SWEET BABY GIRL! You are just so perfect! I LOVE everything about you! Especially the loud giggles and screams that come out of you! You are such a good and happy baby! I'm so blessed to have you! You are such a joy to be around! My life couldn't get any better! I love how you are growing and doing new things everyday! You love to play with your hands and are even ticklish! I have to be careful with you now because you can roll over! You're already trying to sit up on your own and I find it so cute to see you struggling when you're trying to do it. Holy craps! I think I've found my bloggy soul mate. I LOVE your blog! And all things vintage, photography, crafts, hair accessories, etc etc! Happily following you back via GFC :) Your daughter is super adorable, by the way! I'm dying over those leg warmers. She is precious! Thanks for stopping by my blog.. I am now following you too! Oh my goodness! She's gorgeous and looks just like you :) Following you, hun! oh my goodness...she is just too cute! how do you get anything done..don't you just smile at her all day?!!! Precious! I love the chalkboard idea and her outfit it tooooo cute! this is bev at black ink paperie. i have just given you a blog award. check out the details on my blog. just cut and paste the award image for your blog. don't worry about about all the requirements - only do them if you want. Thanks you so much Bev! This definitely brightened my day!! this is so perfect & darling! what a sweet post. i just stumbled upon your blog & it's time for me to explore...your layout & header are awfully cute. xo.